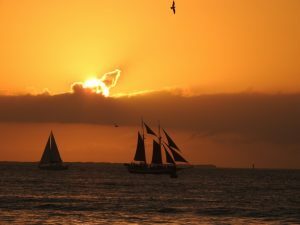 Sunsets at Mallory Square in Key West are events unto themselves. 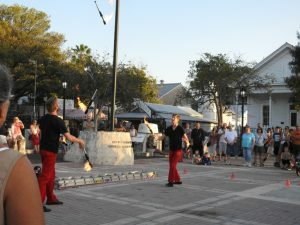 In addition to watching spectacular sunsets you are also entertained by numerous buskers/street performers who really do amazing things. 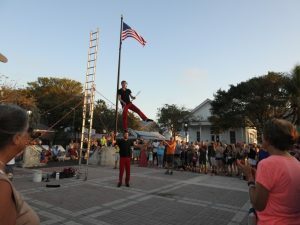 Today we enjoyed a couple of shows with guys doing remarkable balancing acts, juggling flames and knives, and other things we don’t recommend you try at home. 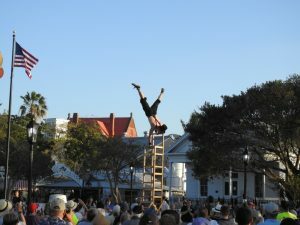 This guy basically stacked regular straight back chairs on top of each other and then balanced in a handstand as his grand finale. The guys in red pants were pure entertainment, balancing on each other, juggling various items including knives and flaming torches. 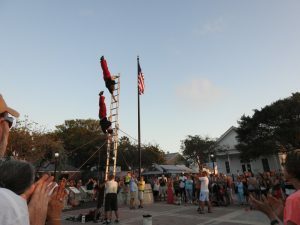 Their grand finale was with each balancing in a handstand on a regular extension ladder (leaning against nothing) that is being supported by four ropes being held by four random members of the audience. 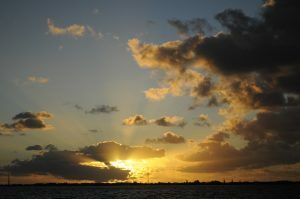 After the performances we focused our attention to the west and the sunset marking the end of a fabulous day. 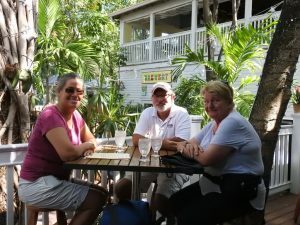 Friends from Australia came to visit us in Florida “since they were in the neighborhood” after they toured Peru and the Amazon. 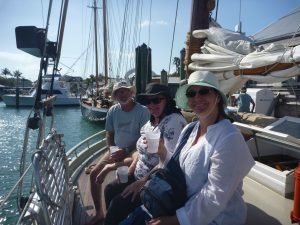 For the next week we played tour guides and tourists and enjoyed seeing more of what Key West has to offer while our friends were here. 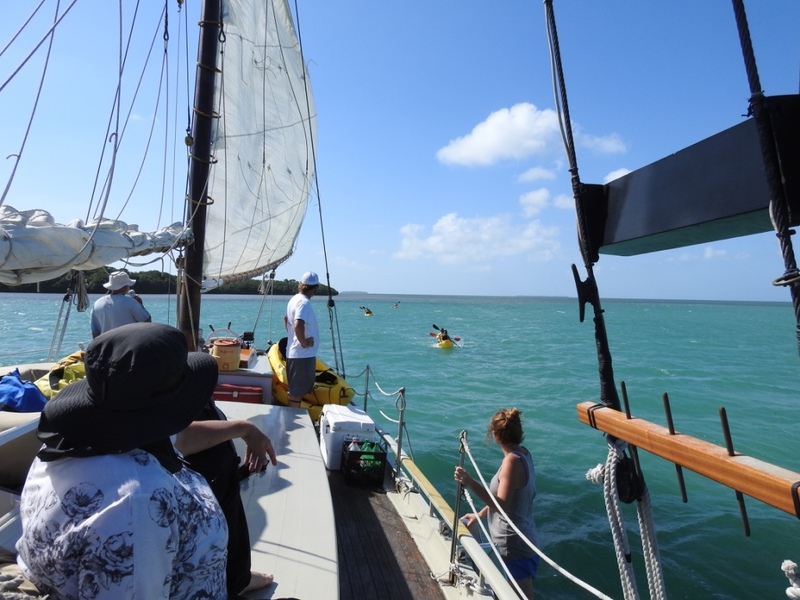 One day we decided to book a sailing charter that took us snorkeling and kayaking. It was great to have someone else responsible for the driving, so we could sit back and enjoy the ride. Today we got to enjoy a manatee family’s visit. 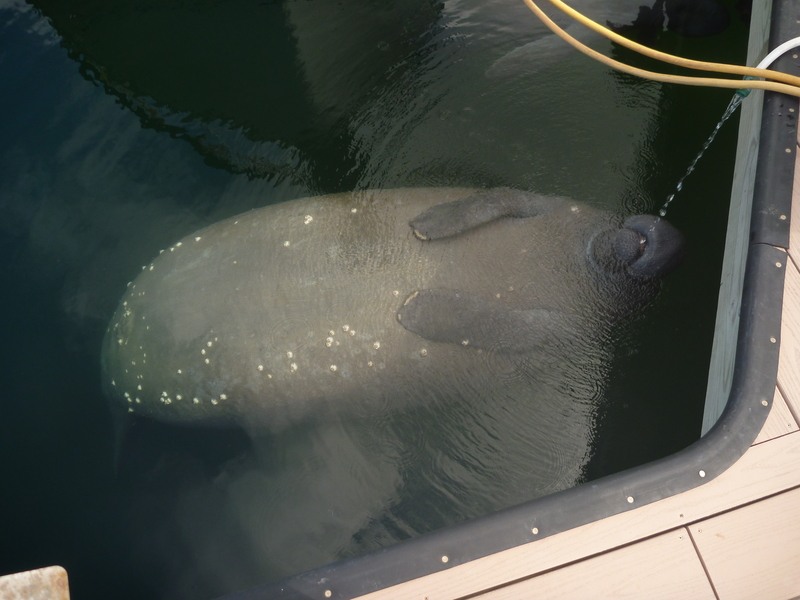 Manatee like to drink fresh water, however it is strongly discouraged to turn a hose on for them. 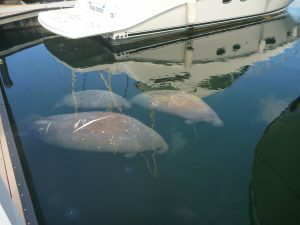 But, one of our dock mates (we aren’t naming names) did just that. 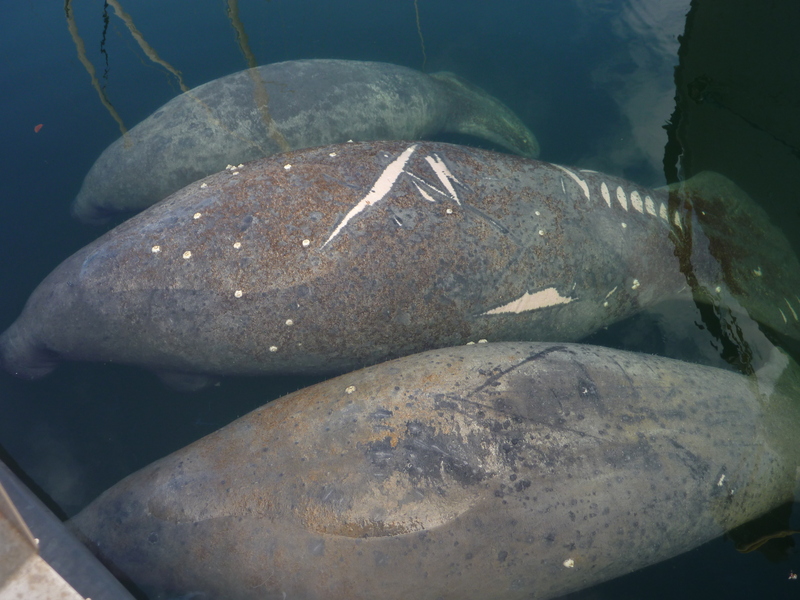 The adults definitely enjoyed the decadence and rolled on their backs to savor the sweet water. After much time watching, researching on google about manatee body parts, and analyzing what we were seeing, we came to the conclusion that the big one ( in the middle of the photo with the scars on her back) was momma manatee, the middle sized one was papa (bottom of the photo), and the small one (top of the photo) is baby. 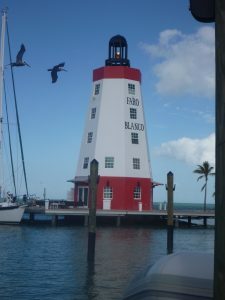 Today we left Faro Blanco Resort on Marathon at daybreak to begin our final passage to Key West, Florida. 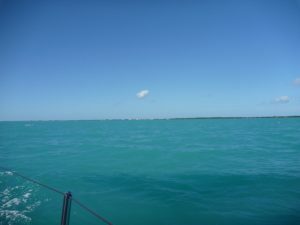 This section required us to go out to the ocean as there is no feasible “inside” route to Key West due to shallow water. 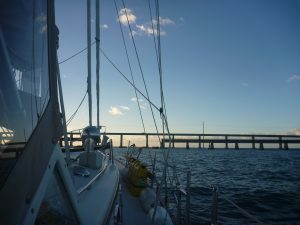 As the sun rose, we made our way through the old bridge which has been dismantled in this section to allow passage by sailboats and under the 7 Mile Bridge before turning right to head southwest to the last island of the keys – the most southern point of the United States. 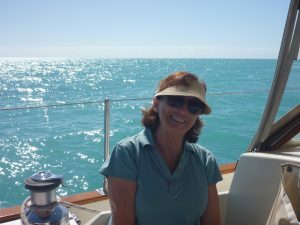 Initially the wind was light and so we motored, carefully picking our way through the minefields of lobster pots. 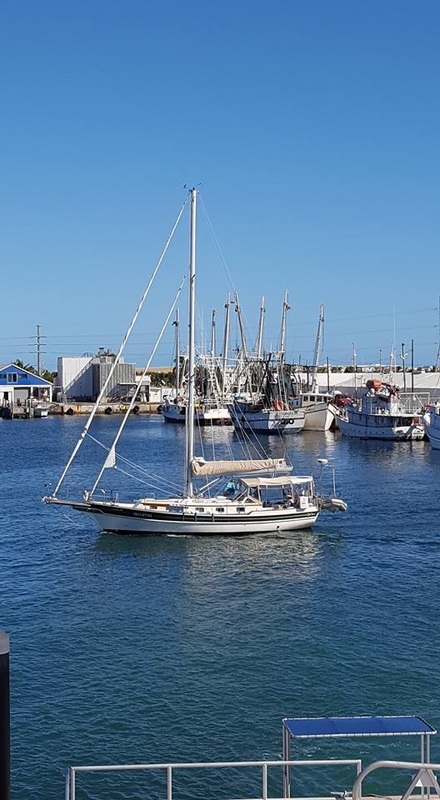 Halfway through the morning, the wind picked up, clocked around to our port side and we were able to raise the sails, turn off the engine and enjoy the blissful peace of silence as we moved through the water. 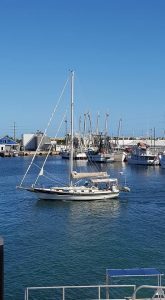 We arrived in Stock Island Village Marina and settled into our slip which will be our home for the next two months. 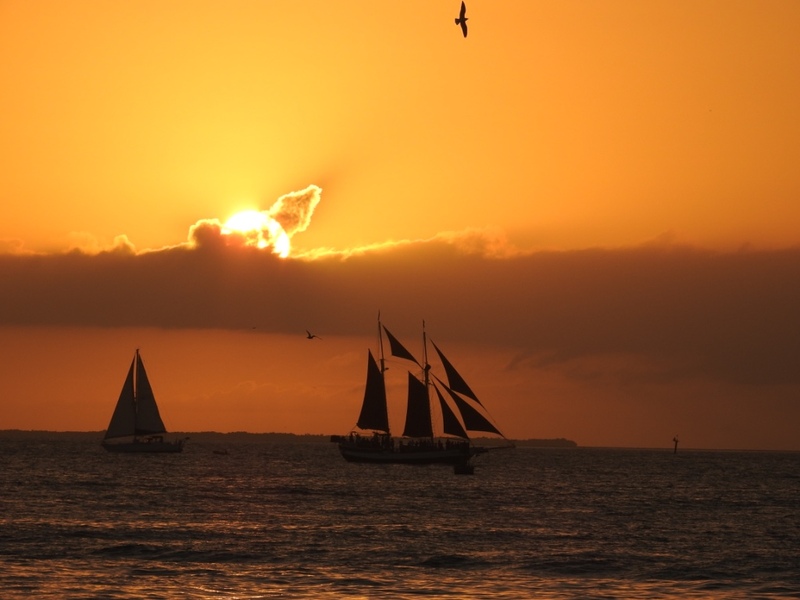 Now it’s time to explore Key West and rediscover some of our favorite haunts from years past. We have been looking forward to this. 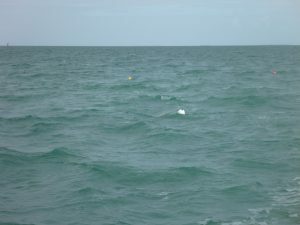 We only were “inside” a few times on the journey south, doing our best to dodge crab/lobster pots and sure enough we seemed to pick up a trap and/or get fouled at least 3 separate times. While Bob was cleaning the boat, he noticed something wrapped around the prop shaft. 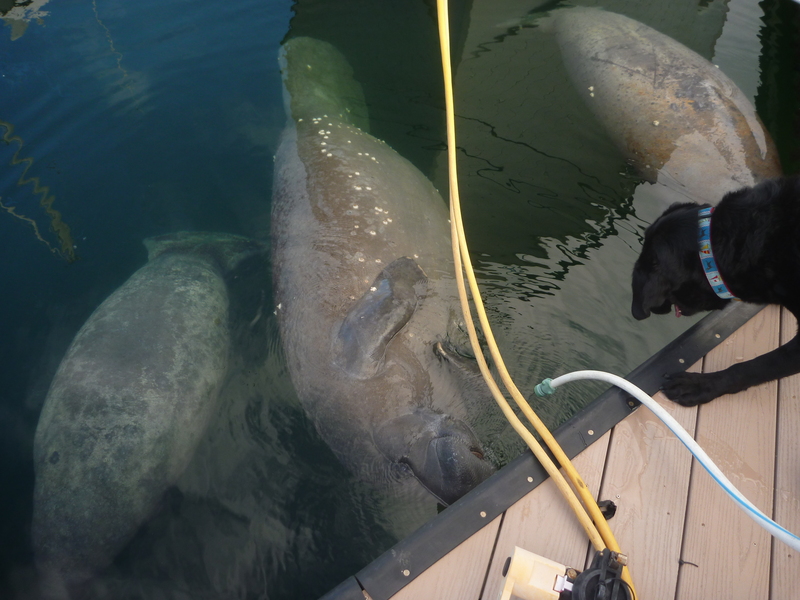 We hired a local diver, Holly, to go down and investigate. 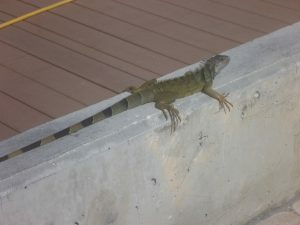 This is what she found! Ugh — wonder how long we had been carrying this around. 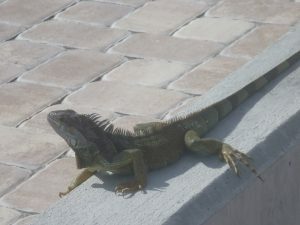 Look who came visiting! This gentle giant (manatee) found a safe place next to Dreamtime to take a nap. As he slept he would raise his head every few minutes to blow and take a breath. 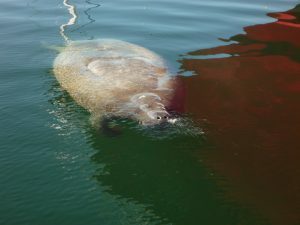 He ended up totally along side the hull, eventually woke up, dove under the boat and docks, and went his way to other waters. 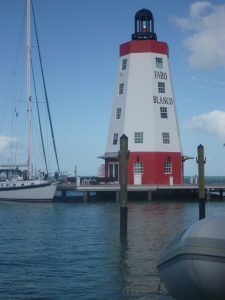 We have been enjoying our time at Faro Blanco Marina, and recommend it to anyone passing this way. The restaurant is awesome with “early seating” specials of all mains $19.99 before 6:30, and great happy hour nibbles at the bar. 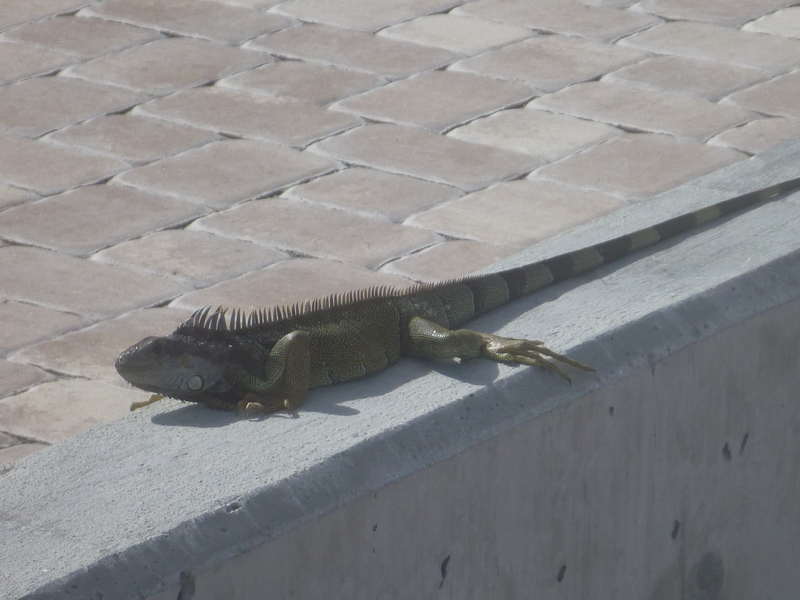 While here we did see a few iguanas that were sunning themselves on the dock. Our challenge today was to make enough space in the aft cabin for accommodate 2 adults comfortably. 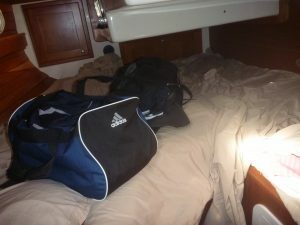 We were successful by putting things that are usually stored on the berth below the forward berth, leaving that to be a bed full time — amazing how much space we can find when we need to! We are ready for Ron’s wife, Sandy to join us tomorrow! 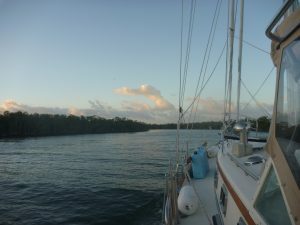 We were up and ready to go before the sun, and waited for enough light to untie the dock lines to start moving again. 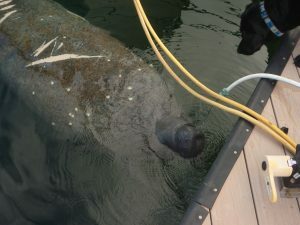 We weren’t very far away from the marina when we heard a new noise – clunk clunk clunk from under the boat. Uh oh! The speed of the clunks correlated with the RPMs of the engine. 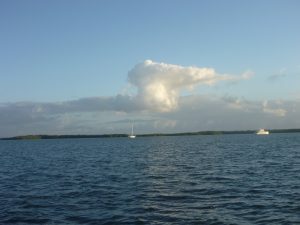 We didn’t feel like we had caught anything, but something was definitely wrong. Do we continue on? Do we return to the marina and get a diver? Is it something more serious? 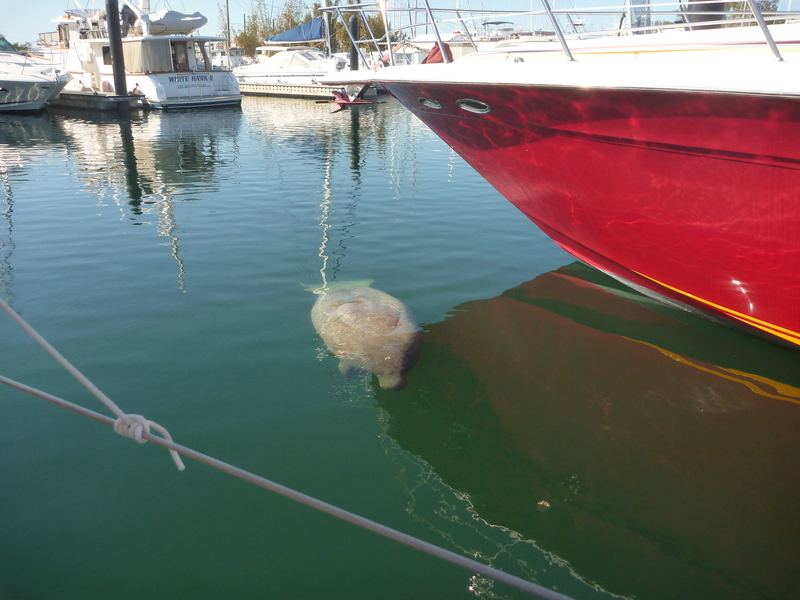 After some initial diagnosis, we put the boat in neutral and then in reverse for a minute. Back to neutral and then in forward and the noise was gone. 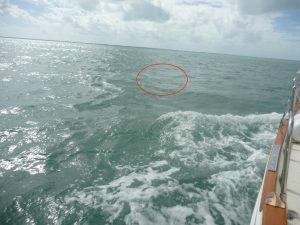 Our guess is that we caught a fishing line or fish trap that got caught in the prop. But it was able to get free with our little maneuver. 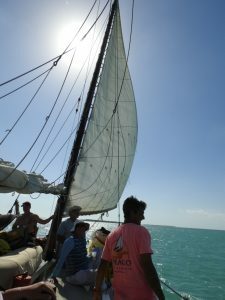 With a sigh of relief, we put the boat back on course and continued on. Today was going to be a long day and we wanted to average at least 6.5 miles per hour to be able to arrive in Marathon by late afternoon. 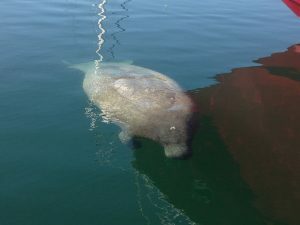 We passed by a large well protected anchorage we had heard about, and plan to possibly try the next time we pass by this way. We knew the first 10 miles was going to be through shallow areas and with wary eyes on the depth meter we made our way through. Whew! We thought the worst was over. 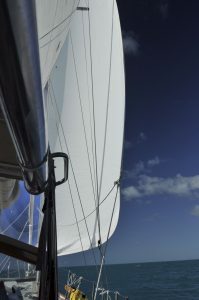 We unrolled the staysail to take advantage of some wind and thought we might be able to relax for awhile. 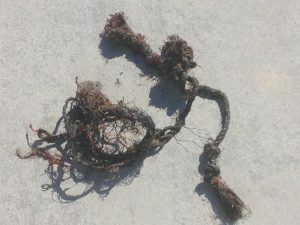 We had been told by friends and the cruisers forums to be aware that fish traps would be a hazard for the next 10 miles. We had seen many before, and thought nothing of it until we entered the “zone”. OMG – traps galore. It took 3 sets of eyes constantly scanning the waterway to pick our way through the minefield of traps safely. A brief respite as we navigated through a narrow channel between strips of land, and then, traps galore again. 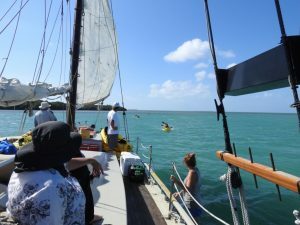 We saw a less fortunate sailing boat who must have been more focused on the traps than watching the channel markers hard aground in what the charts showed as less than 1 foot of depth. There was nothing we could do to assist them without risking the same demise, and so we continued on through the minefield. 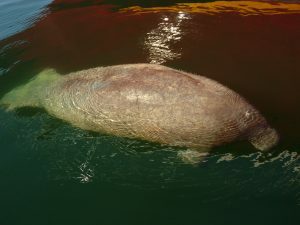 In the midst of it all we did see a large sea turtle on our port side. You can’t tell by the photo but trust us, there was a large magnificent sea turtle that dove below as we approached, apparently a bit camera shy. 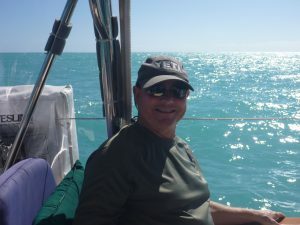 Finally the traps thinned out and we were able to enjoy a few moments of peace before we turned toward land and the Faro Blanco Marina Resort where we would stay for a few days before our crewmate’s wife Sandra would arrive for the last leg to Key West (Stock Island), Florida.